New software/hardware means we will NO LONGER PROVIDE CADENCE SENSORS. If you care about your cadence, you need an Ant+ cadence sensor. The good news is most of you have these already- Garmin, Wahoo, etc. Or if you have a power meter that tracks cadence, that will work too. The good news is the system will automatically pick up your sensors wirelessly and store the IDs. So no more wires, velcro, magnets, etc. You can buy a cadence sensor from us for $37. Note that this will work with most cycling computers, apps, etc. This also means that the system can pick up your power meters and heart rate monitors too, if they are Ant+. No more Polar only for heart rate. 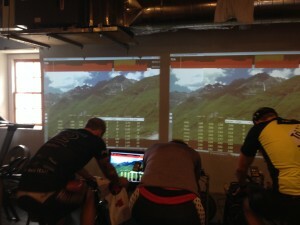 And if you have a power meter, the screen will display your power meter power, not the Computrainer power. We also can get you Wahoo Tickr heart rate straps for $55. Fee schedule is changing. We have not raised rates since we opened in 2009. If you have an existing pass, it will be honored, BUT – weekend rides are 1.5 rides. The new pass fees will likely be $16 per weekday ride, $24 per weekend ride. To make this easier to track, the 10 ride pass will have 20 “punches”, $8 a punch. Weekday rides will use 2 punches, weekend rides 3 punches. 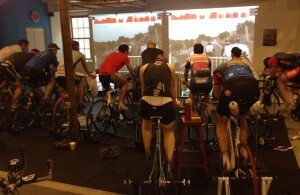 There looks to be a Tues-Thurs coached evening group (mainly Bikeworks team) like last year. If the Team does not fill the slots, it will be open to others. It will start after the New Year. This will be a fixed-price class (it will not use regular ride passes). Price tbd. We expect to run Wed evenings and Thurs 9am classes along with weekends. Early morning weekday sessions look to be a private group at this time. Duck Season! Wabbit Season! Duck Season! Wabbit Season! PAIN CAVE SEASON! BANG! No more excuses – if you aren’t already in PAIN at least once a week, then how can you call yourself an athlete? 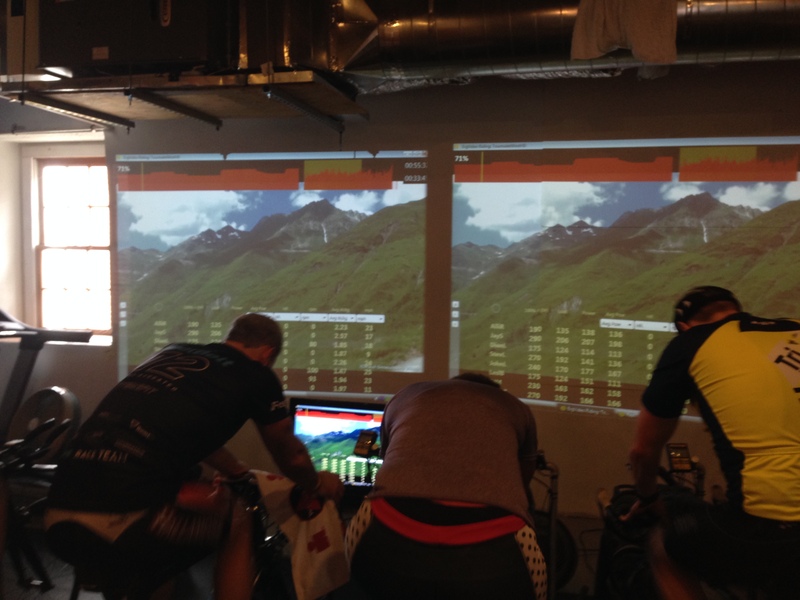 There is some great info on the Ergvideos and training plans we use in the Pain Cave in the latest newsletter. The Trueform is NOT your average treadmill. For one it lacks a motor. Other than the one the runner has built in that is. The uniquely curved deck and smooth resistance require you to run properly and generate elastic force to move the belt. 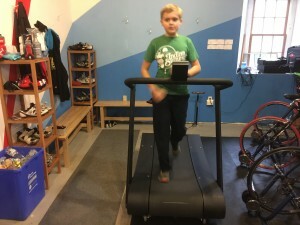 Motorized treadmills are only about keeping up with the belt, crappy form or not! The Trueform will go as fast as you want it to. But let me tell you, it ain’t easy! We look forward to using the Trueform for winter run form improvement. Come in and give it a try! Check out their website which has many interesting videos on run technique/form. We are starting tentative planning for a 8-10 week (beginning early Jan 2015) training program geared towards bike racers. This will be a 2-3 days/week commitment. The workouts and the entire progressive plan has been created by Hunter Allen of Peaks Coaching. Make it through this and you WILL be a much stronger rider next season. Note that if we have enough demand from triathletes, we can set up a similar plan specifically for long or short course tri. Early start this year due to what looks like CRAPPY weather this coming weekend. We have sessions scheduled for both Saturday and Sunday am. Until the bad weather really locks in, indoor sessions will be totally weather-dependent so watch this space and gottafit.com for schedules. 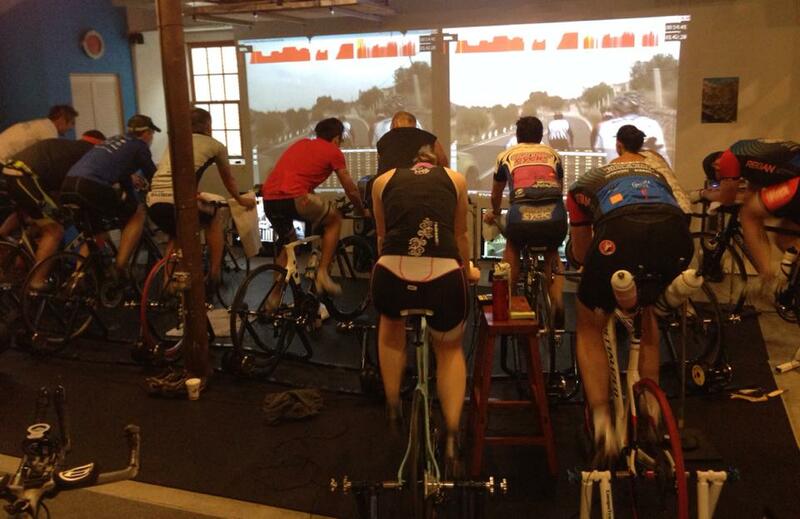 Check out Xtri’s article featuring our Desperate Housewives session and ErgVideos!